Many of our Jewish ancestors chose to emigrate from countries such as Russia in search of a better life. They wanted very much to escape the discrimination and selective persecution that had dogged them on a daily basis. Except for the period of time when Czar Alexander II ruled Russia (between 1855 and 1881), Jews were subject to arbitrary laws that singled them out for pejorative treatment. Some of these laws dealt with how many and by what means the Russian government would conscript (draft) Jewish males into the Russian Army. Actually, even though many Jews had been or wished to be patriotic, they were not allowed to serve in the Russian military until 1827, soon after Czar Nicholas I took power. Before then, they were kept out of the army because including them with the other fighting men might have suggested that the Jewish soldier had earned the same rights as the non-Jewish soldier, and the previous czars and nobility did not want that. Unfortunately, many in the general population who were ignorant to this ban, mistakenly thought that Jews were cowards or unpatriotic because they were not serving in the Army, and of course, this turned into yet another reason why others thought so poorly of the Jew. Eventually Jews were permitted to become soldiers in the Czar’s army. Youths as young as twelve years of age were conscripted. The rate of conscription for Jews was significantly more than for non-Jews. Also, Jews in different areas were often subjected to various quotas that had to be met. If a town could not supply the required number of men, those previously ruled ineligible for conscription were forced into the army until the quota was met. In 1876, a Jew that was unfit for duty had to be replaced by another, regardless of the reason. One could not escape their duty easily. If a person somehow managed to evade military service, his family could be fined 300 rubles, which was quite a large sum of money in that time. If someone managed to catch a potential conscript trying to flee, he could get a financial reward of 50 rubles. The real reason that the czars created these laws was that they wanted to decrease the number of Jews in the general population, either by attrition or by their conversion to Christianity. One way of doing this was by drafting them for a term of twenty-five years. Only during the reign of Alexander II was the term reduced to five to ten years. 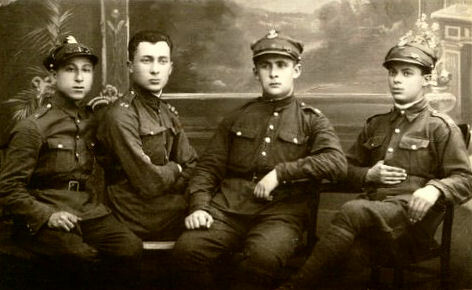 By keeping Jewish men and boys in the Army for such a long period of time, the Russian government had hoped to separate them from their shtetl and their Jewish roots for a such a long time that they would eventually be more willing to convert to Christianity in order to improve their conditions. The pull of conversion was great. By being baptized and becoming a Christian, they would be treated more fairly and have the same rights that a Christian had. He would be able to more easily advance in rank. Also, the Jewish convert would be exempt from taxes for three years. 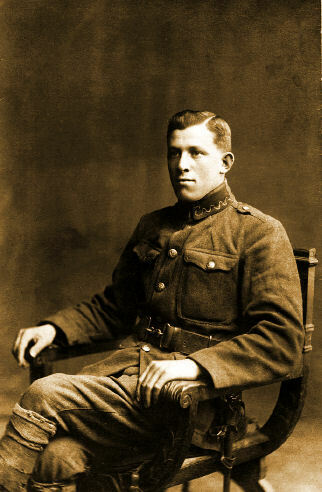 Photo, right: My great uncle Charles Burack, who spent a short time in what was probably the Polish army, cir 1920. 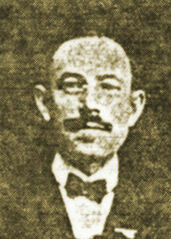 He eventually found his way to either Cuba or Canada, and then to the U.S. cir 1924. Often conscription was tied in with the payment of taxes. If a family was late in paying their taxes, a family member could be conscripted. Even after this occurred, they would still owe the full amount of taxes! Many tried various methods to avoid conscription, but how many remains under debate. Some chose to self-mutilate themselves. Others tried to change their name while others tried to get adopted by other families, all to avoid that twenty-five year sentence in the army. None of these methods would necessarily keep a Jew out of serving with the Russian military. The Russians forced Jewish communities to supply the required number of Jews for the army. Committees of Jews called kahals were formed, and they were required to supply the correct number of Jewish males, and were told to do so by any means necessary. If the kahals failed to do this, the Russians would conscript invalids, cripples and men normally too old and/or feeble to serve. There would be no exemptions for sole supporter of family, no exemptions. 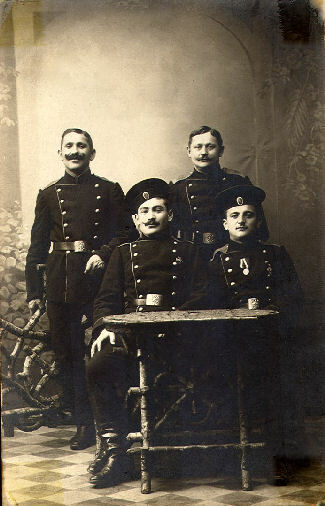 Photo, left: Shaul Frydman, second from the left, with other Polish army soldiers, 21 Oct 1927. The photo was either taken in Deblin or Ryki, Poland. Certain towns would deliver recruits that had no passport, or if there was someone in their jurisdiction who came from another town, they might take them too. Some communities employed khappers, who also were Jews, whose job it was to round up the right number of Jews, even if it meant they had to kidnap them. They often would take children as young as eight, and bring them to some inaccessible place where they would be kept under wraps until they were twelve years old. Then they would be conscripted into the Russian army. Is it any wonder why our ancestors wanted desperately to get so far away from where they lived? It should go without saying that the Jews who were forced to serve in the Russian army were subject to varying degrees of brutality. The incidence of Jewish soldier deaths was known to be higher than that of the non-Jew. Israel Drozdiasz, from Karczew, Poland (then Russia), played this musical instrument, probably the flugelhorn, for the Russian Army. We can see then that at various times Jews were forced to turn against Jew, and this, of course, was very unfortunate. I suppose that it shows us that no matter who it is, people who want to survive will often do whatever they have to do to protect their family. Many, many Jews decided to leave Russia by whatever means they could. Many left illegally with forged papers. This is one reason why genealogists occasionally have such a difficult time trying to find records of their ancestors in Eastern Europe. Some changed their names for various reasons; others registered in towns other than the one they grew up in. There was a great wave of emigration in the 1880s once Czar Alexander II was assassinated. He was the one who had reduced the length of time a Jew had to serve to "only" five to ten years. Many Jews were fearful that whoever the new czar would be might very well institute once again the twenty-five year old term of service. Rumors also spread that it was a Jew that was responsible for the Czar’s death. So the Jews fled in great numbers, with the majority of them immigrating to the United States.